To own a precision timepiece that has been meticulously designed and handcrafted by an expert watchmaker can be compared to possessing an exquisite piece of art. The combination of master craftsmanship, innovation and attention to detail that go into the creation of these luxury timepieces is nothing short of extraordinary. We’ve brought together a collection of the best of the best for 2012. In these pages you’ll find watches that showcase the latest innovations in calendar functions, time zone features and high style. Whether you prefer the look of a classic chronograph, the intricacy of a skeletonized mechanism or the sparkling appeal of the latest in Haute Joaillerie, you’ll find it here. Ulysse Nardin launched the first Perpetual Calendar, which allows forward and backward adjustment of all calendar functions over a single crown, in 1996. This extraordinary invention set a milestone in the history of watchmaking by combining technical innovation and the user’s comfort. The El Toro Perpetual Calendar is equipped with this iconic manufacture movement featuring an exclusive time zone quick-setting system. Moreover, the hour hand is adjusted instantly to a new local time with pushers (+/-). The adaptation of the oversized date — the day, month and year — is synchronized with the movement of the hour hand. Montblanc honored the ingenious French watchmaker Nicolas Rieussec in 2011 with a jubilee wristwatch to celebrate the 190th anniversary of the invention of the chronograph. The tribute was well-deserved, especially when one considers the importance that chronographs have acquired in the world of fine watches in recent years. This face, which is as elegant as it is unmistakable, lies above Caliber MB R210, a new movement which uniquely combines classical chronograph mechanisms and modern technical solutions. A new feature is the display of the time in a second zone via a rotating disc rather than a second hour hand. Visible through circular apertures in the dial, this disc is skeletonized so that nothing remains of it except its wreath of teeth with an hours scale along the rim and slender spokes emanating from its center. This new Caliber, which was likewise designed and built by Montblanc, impressively confirms the watch brand’s status as a full-fledged manufacture. 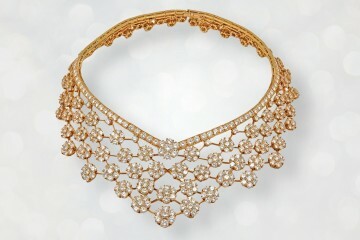 This is the latest Haute Joaillerie creation from Hublot. It is set with 440 baguette diamonds and 451 brilliant cut diamonds, in total no fewer than 891 diamonds and a total of nearly 28 carats! It is a 44 mm Big Bang, an automatic mechanical chronograph with a matte black dial with eight indexes, each made with a baguette diamond. It is a genuine showpiece, both in terms of the expertise shown in setting the diamonds, and in terms of its design which is perfectly in keeping with the codes of the Big Bang — sporty and refined, elegant and contemporary. In 1996, Ulysse Nardin introduced a patented Dual Time system — one of its many technological breakthroughs. This revolutionary system exists in the Lady Executive. With only one press of the ceramic pushers along the bezel, the hour hand instantly adjusts to a different time zone without ever having to leave the wrist. No nonsense in demeanor, practical in complication, and with a refined, all-eyes-on-her styling, the Executive Lady is as confident and stunning as its muse — the woman who knows she has it all — and the perfect selection by the man who wants to give her his all. The Oyster Perpetual SKY DWELLER presented at Baselworld 2012 is the latest addition to the Oyster collection, a compelling timepiece of revolutionary design that blends to perfection technological sophistication and ease of use. The SKY DWELLER is designed for those who place the emphasis on useful functions, effortless manipulation, prestige and elegance above all. The ultra thin self-winding Perpetual Calendar has ranked among Patek Philippe’s most popular complicated watches for many years. Now, the workshops are relaunching it in a format that emphasizes the brand’s heritage in perpetual calendars: the Ref. 5940 in an 18K-gold cushion-shaped case. With its new Ref. 5940, Patek Philippe opens up a new chapter in perpetual calendars with the revival of the cushion-shaped case that looks as topical today as the 1920s and 1930s Art Deco showpieces in the Patek Philippe Museum that inspired it. The stately timepiece is worn on a hand-stitched alligator strap with square scales and a prong buckle in 18K yellow gold. With a love of detail and a lot of feeling for aesthetics, Armin Strom’s philosophy is reflected in each exclusive product. Today, Armin Strom is concentrating on its own in-house production of watch movement components which are manufactured in a painstaking, manual process. The ARMIN Manual Collection with its own in-house produced AMW11 calibre is presented in its latest execution, displaying many detailed improvements. In the development of the new generation, the focus was on the individual elements of the watch movement, to ensure that the exclusive Armin Strom series includes state of the art technology. The readapted gear train guarantees an even higher efficiency level. In order to minimize the power loss within the watch movement, the integration of the escapement has also been improved. As is to be expected of a traditional manufacture, the hand finishing of the movement decoration is of the highest quality. The noble, highly attractive dial with its new multi-level structure offers the watch greater depth. The ARMIN Manual Collection clearly strives for technical and aesthetic perfection in every model and is available in a limited series of the four elements: Earth, Water, Air and Fire. IWC Schaffhausen gets off to a powerful start in 2012: the year of the Pilot’s Watch. With five new models, the TOP GUN collection establishes itself as an independent formation within the IWC Pilot’s Watch family. With a clear focus on technology and development, the Swiss watch manufacturer IWC Schaffhausen has been producing watches of lasting value since 1868. The company has gained an international reputation based on a passion for innovative solutions and technical ingenuity. One of the world’s leading brands in the luxury watch segment, IWC crafts masterpieces of Haute Horlogerie at its finest, combining supreme precision with exclusive design. Bell & Ross haute horlogerie watches are coveted by men for whom time is a true passion, not just a tool. Bell & Ross’ objective when designing the BR Minuteur Tourbillon was to offer these aficionados an exceptional, ultra sophisticated measuring instrument, a watch that in and of itself combines all the brand’s watchmaking know how. Trimmed in pink gold, the BR Minuteur Tourbillon is synonymous with high technology and elegance. To the delight of enthusiasts of rare, high-performing time instruments, Bell & Ross has achieved a lofty goal by taking a calculated risk: to combine the precision of a major watchmaking complication with a professional instrument. To create watches for a collection which bears the name of such an incomparable and unforgettable personality was a challenge that continues to fill Montblanc’s designers and jewelers with pride. A consummately designed watch like this one is an ideal field on which jewelers can give free reign to their creativity and craftsmanship. Here, they’ve been inspired by the love of flowers, for which Princess Gracia Patricia was famed, not solely because of her fantastic rose garden. Floral adoration is expressed in the one-of-a-kind “Pétales de Rose motif” model, on which countless rose-petal contours adorn a white mother-of-pearl dial and nestle closely side by side to form a precious white gold bracelet that scintillates with the gorgeous fire of 605 brilliant-cut diamonds. Carl F Bucherer reflects its individualistic and entrepreneurial traditions in its approach to watch design. One of the very few Swiss watchmakers to remain a family-run business since its founding in 1919, Carl F. Bucherer creates watches for people who wish to live life on their own terms — confidently, resolutely and independently. This philosophy manifests itself in Bucherer’s Patravi Calendar timepiece, which is equipped with the extremely resistant and reliable CFB A1000 Manufacture caliber. The case is produced in stainless steel or 18K rose gold and has a diameter of 42.6 mm. The Patravi Calendar features a big date at eleven o’clock. The small seconds function is indicated on the case by means of a disk. As this does not visually obstruct the indication of the weeks, it ensures optimum readability for the wearer. This visually striking piece by Franc Vila features an interplay of circles and curved lines. The dial is amazing and it has a three-dimensional “floating” look, with partially skeletonized subdials. Through the exposed subdials you can see the “perlage” circular decorative patterns on the mainplate. Franc Vila developed his finely handcrafted complicated wristwatches and fundamentally reinvented forms, building into the future by respecting the past, creating watches that are contemporary while retaining their classical spirit. Built on the design of ultra exclusive mechanical hand wound movement by the complication grand master Christophe Claret (whose own watches cost more than $700,000), this piece displays hours and minutes in the center and has the tourbillon cage at six o’clock. The movement has been completely skeletonized for optimum lightness — all of its components have been pared down to the bare essentials. To the immense joy of collectors, the Tourbillon Magistère can be admired from all angles in total transparency, through the curved sapphire crystals on the front and the back. It’s light for the eyes and light to the wrist. The Tourbillon Magistère, the mysterious ambassador of Guy Ellia, is water resistant to 30 meters and mounted on an alligator leather strap with a white gold folding clasp and boasts a diamond cabochon on the winding button. This rather large timepiece, measuring 47 mm in diameter, is the ultimate luxury sport/casual watch, but can also make a strong statement in a business meeting. The uniquely shaped case is a beautiful interplay of brushed and high polished hand-finishing. The dial is made with a solid piece of precious meteorite, a hard to find material normally reserved for very special pieces. Owning an exceptional unique watch is a rare privilege and to wear it an exclusive art. It is Franc Vila’s commitment to present new classics through the understanding of the contemporary world. To celebrate winning the Aiguille d’Or award, De Bethune revisits this iconic model and offers a limited edition featuring subtle details that are sure to delight collectors and dedicated enthusiasts. The characteristic aesthetic of the DB28 is enriched by a polished steel skeletonized hour circle, zirconium floating lugs and a blackened steel moon. These exceptional timepieces feature a pure style in which the taut lines, the exquisite handcrafted finishes and the slenderness of the case combine with the technical innovations to offer a contemporary expression of art. 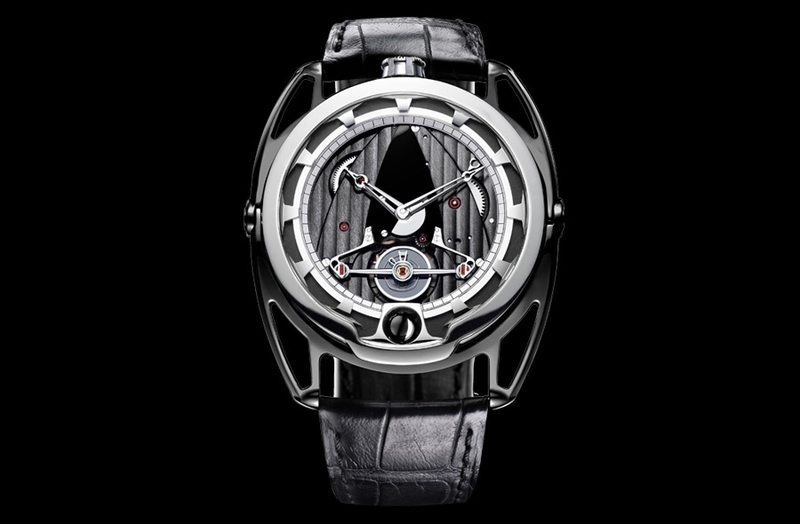 The Christophe Claret DualTow Watch is a unique timepiece that is designed with elegance and luxuriousness that most of us look for in a watch. This timepiece also displays a complicated movement that will surely get your interest. The major innovation introduced in the DualTow is its single-pusher chronograph function operating by means of three identically structured planetary gears. An exclusive patent has been filed for this entirely original interpretation of the chronograph in order to defend the peerless technical qualities of the system. Building on this successful innovation, Christophe Claret has chosen to further enhance the refinement of this caliber by adding a striking mechanism signaling the chronograph start, stop and reset operations. Expressing their unfailing attention to each and every detail, the watchmaker and his team set the finishing touch to the mechanism by equipping it with a chronograph function indicator. With its dynamic sporty dial, the Academia Chronostream boasts a classically audacious design. The sleek round case lends a natural elegance to the look, with its 24 imperial columns proudly positioned on the flanks and the bezel. The self-winding mechanical movement features a robust 48-hour power reserve. This year, the Chronostream comes in 18 carat rose gold and grade 5 Neotitanium – an innovative blend of materials characterized by extreme robustness and lightness. With its slightly larger case, the taupe grey tones of this new timepiece ensure a chic look.